I was hosted by Watkins Glen Area Chamber of Commerce and Steuben County CVB during my stay in the Finger Lakes. I want to thank them for arranging this tour, and Steve and Anne for their warm hospitality. The gray sky looms over us as we roll down the dirt road, unsure if we’ve reached the right place or are trespassing down a stranger’s driveway. It’s that perfect combination of a cozy-dreary day, alternating between a fine mist and a soft, soaking rain–the kind of day that makes you want to curl up on the couch with your grandmother’s afghan and read a book. But we have our hearts set on seeing how this couple in Upstate New York grows shiitake mushrooms on logs in the woods, so the book will have to wait. The colors of the forest around the house are muted, with the vibrant green days of summer long behind them and the steady rain forming droplets on every little surface. My writer friend Angela and I are both feeling a bit melancholy about the rain, hoping it doesn’t ruin our plans. Angela is a total foodie and amazing cook, and while I’m a recent convert to eating mushrooms, I love getting to know small, local farmers and seeing how they care for the land. And both being nature girls at heart, we had jumped at the chance to visit a shiitake mushroom farm in the woods on our trip to the Finger Lakes. Our wondering about the weather is interrupted by a friendly face coming out to meet us, and we roll down the car window just enough to hear him while keeping the rain out. Steve introduces himself and tells us, “You can park over here next to the shop–my neighbor might need to work in the garage so I don’t want to block him.” It’s still raining when we get out of the car, and we stand there for a minute, indecisive about what photography equipment we’re going to take out on our trek in the woods. As I’m debating whether to wear my rain coat or the bright yellow rain poncho that I keep in my camera bag for emergencies, Steve suggests an alternative plan due to this inclement weather. “We had someone here over the summer who made a short film about us for a series called Woodlanders, so my wife and I thought we could go inside the house for a few minutes to watch it while we wait for the rain to let up.” Certainly it’s not part of their usual farm tour, but I think we’re all looking forward to getting out into the woods aren’t willing to let the rain intrude on our plans just yet. We meet Steve’s wife, Anne, as she welcomes us into their home. I take off my jacket and sneakers–already muddy from the walk across the driveway–as I try to balance on one foot with the weight of my camera bag threatening to knock me over. She offers to let us wear some of her boots when we go out, and I protest at first but am later glad I decided to acquiesce. We walk through the living room and the four of us gather around their kitchen table, where dried mushrooms and herbs are scattered in baskets and mason jars. Steve starts to pull up a video on their laptop and Anne offers us something to drink, and their calm, welcoming demeanor has Angela and me feeling instantly at home. As we wait for the video to load, I look out onto the forest through the large windows that cover two walls in the kitchen and silently wish for the rain to slow. When the video begins to play, Steve jokes, “We don’t usually have a band playing down there by the creek.” After we watch, Steve and Anne begin to tell us about how they came to grow shiitake mushrooms in the woods behind their home. WOODLANDERS EP4: WOODLAND MUSHROOM CULTIVATION from Costa on Vimeo. Steve and Anne Sierigk started growing mushrooms in the 1980s for their health benefits when they first bought their land in the Finger Lakes region. 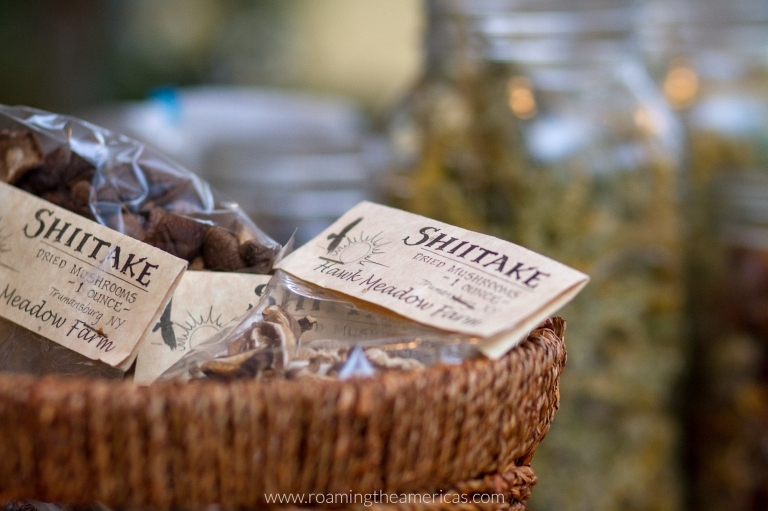 They knew that shiitakes were considered to have medicinal and immune system boosting properties and had been used in Asian medicine for thousands of years. They were already incorporating these mushrooms into their daily diet–in the form of a morning bowl of miso soup–so when Steve saw an article about how to grow them, he decided to give it a try. In recent years, Steve and Anne have started to offer farm tours, which allow visitors see their operation in person and learn about how they grow mushrooms. If hearing a terms like “forest ecology” and “woodlot management” gives you flashbacks to boring sixth grade field trips, rest assured that Steve and Anne’s passion for what they do sparks curiosity in the science behind how mushrooms grow and what it means to have a “healthy forest.” You’ll leave with a new appreciation for the woods and how nature works so beautifully together. Hawk Meadow Farm is located in the Finger Lakes region of Upstate New York. Farm tours are available at $10 per person from May – September by reservation only. Get more details and booking information on Hawk Meadow Farm’s website. Please check the website for current information and to purchase tickets. You can also stay awhile if you’d like. Hawk Meadow Farm has campsites listed on Hipcamp, a booking platform that lists ranches, farms, vineyards, nature preserves, and public land campsites across the U.S. Find the Hawk Meadow listing here, and get $20 off when you sign up with Hawk Meadow listing here. Just 3 miles away from Finger Lakes National Forest and less than 30 minutes from Ithaca and Watkins Glen, there is plenty to explore in the area! WOODLANDERS is an online film series that seeks to document the work of people who care for and depend on forests for their livelihood and well-being throughout the world. Check out the whole series here, and consider donating to support this crowdfunded project. I was hosted by Watkins Glen Area Chamber of Commerce and Steuben County CVB during my stay in the Finger Lakes. I want to thank them for arranging this tour, and Steve and Anne for their warm hospitality. I was not required to give a positive review, and I maintained editorial control of this content. All opinions expressed are my own.